Sometimes you need a weekend getaway to unwind. Your mind and body will thank you. We are so busy that we fail to listen to what our bodies and minds tell us. I have a full schedule during the week and I spend most weekends doing house work or working on the blog. I barely have a moment to think "I deserve time to relax" because obligations haunt me. Earlier this month my husband and I decided to put everything aside and spent a weekend in Avila. It's a short way from Madrid, a 90 minute drive. If you are visiting Madrid, it can be a very interesting day trip. Avila is a "City of Saints and Stones", a World Heritage city famous for being the birthplace of St Teresa. Patisserie in the main square. Taking home sweet treats from Avila is a must. 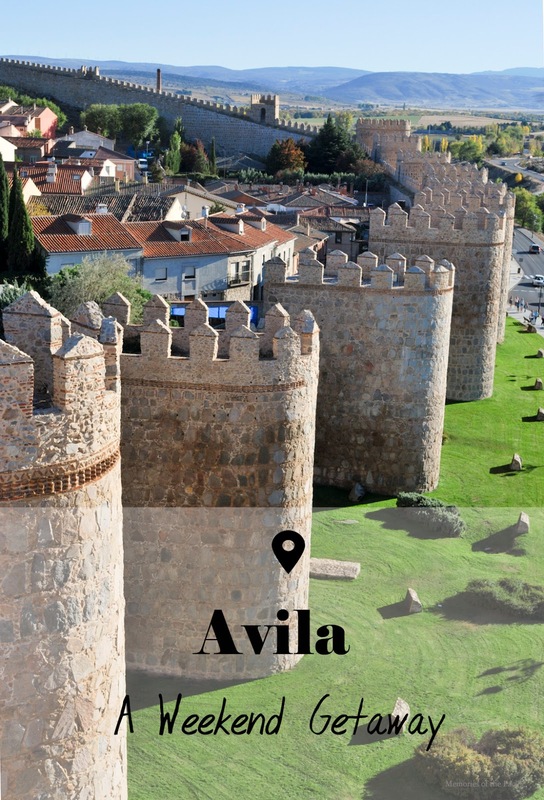 Avila's Old City is surrounded by magnificent city walls. It is one of the best-preserved medieval bastions in Spain. It is a deeply religious city with many churches and convents. It has attracted pilgrims to the cult of Santa Teresa de Avila for centuries. The city walls: 12th-century walls stretch for 2.5km, two sections can be climbed to get spectacular views of Avila. The convent of Santa Teresa: built in 1636 around the room where the saint was born in 1515, this is the epicentre of the cult surrounding Teresa. The Four Posts: this place provides the best views of the city walls (especially at night). It marks the place where Santa Teresa was caught by their uncle as she tried to run away from home. Basilica of San Vicente: a masterpiece of Romanesque built in the 11th century. The cathedral: it was the first Gothic church in Spain. Plaza del Mercado Chico: main square of the city where you'll find the City Hall. Large beans and veal steak are typical from Avila. The city's gastronomy is based on agricultural and cattle-farming products. The most popular treat are the delicious yemas de Santa Teresa (egg yolk sweets). You can find them all around Avila but there's this amazing store in the main square that will make your mouth water just by looking at their window. We stayed at El Parador. If you follow the blog, you know we are big fans of this hotel chain where you get the chance to spend the night in palaces, monasteries or other Spanish historical landmarks. We even got married in one of them! The one in Avila is called Piedras Albas Palace. Our favorite spot was the garden (pictured below) where you can have your meals surrounded by little birdies while admiring the city walls... This is the life! You can read more about these unique hotels here and here. Our favorite spot at El Parador. ...ending at night time, when the city is illuminated to magical effect. This also allowed me to practice my night photography skills. Carrying a tripod around can be a nuisance, but you forget all about it when you get home and see the beautiful pictures. After this weekend getaway we felt our batteries were fully charged to start a new work week. Our minds were definitely thankful for the break. Pin the image below if you liked this post to help spread the love. Thanks for your support! Que maravilla de fotos Cristina !! , la que has hecho con toda la muralla de fondo es una pasada ; quiero comprarme una cámara de fotos estas Navidades y tal vez tu me puedas aconsejar porque veo que la tuya hace una fotos espectaculares , aunque supongo que también has recibido algo de Fotografía . Justo este fin de semana estuve viendo en la tele un programa sobre Ávila y me pareció una ciudad muy bonita , interesante y con muchísima historia , nunca he ido pero ya va siendo hora que la visite . Un gran post . Con respecto a la cámara, depende de lo que busques. ¿Quieres una réflex o compacta? ¿Qué sueles usar para las fotos del blog? What a glorious place - I'm sure it would be suitable for far, far more than a weekend! What a dreamy place. All pics are amazing. Would love to visit it for sure! Love this amazing post with stunning pictures, truly inspiring. I just arrive in Barcelona, would love to go to Avila in the coming days, thank you for sharing!!! Your photos are beautiful dear! The last two are breathtaking. It looks so pretty there!! I love all the photos you got. That's so pretty! Lovely pictures! Wow! Absolutely stunning! I just can't get over those walls! Gorgeous pictures! This looks like such an amazing place to visit and looks like you had a great time! Avila looks so pretty, love the photos! Such a beautiful place! Glad you had a good time!